The Rule of Cool states that people are willing to make allowances for something that’s cool. And powered pop-ups like the one on the Oppo Find X and vivo NEX S are certainly quite cool. The final verdict from last week’s poll shows that slightly less cool but more practical solution – manual sliders – prevailed. 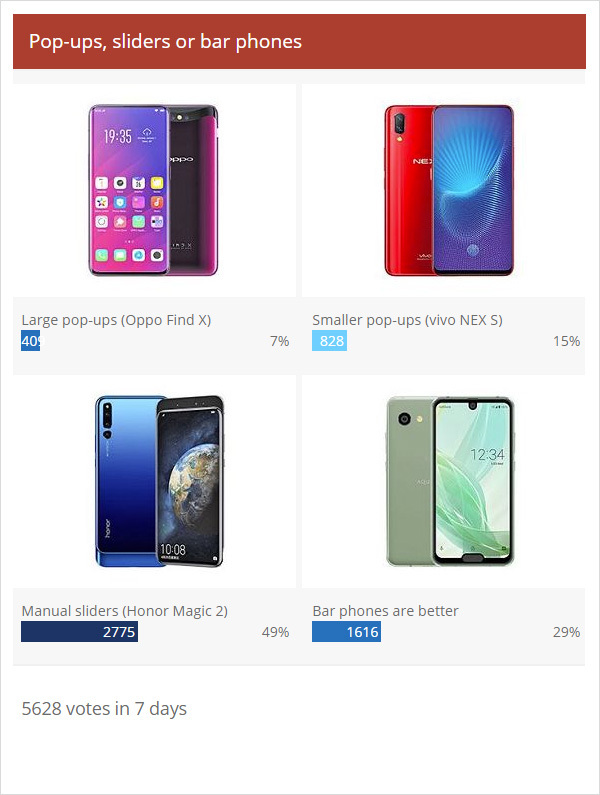 With nearly half the vote, the style of phones represented by the Xiaomi Mi Mix 3 and the Honor Magic 2 are the clear favorite. Reliability seems to be the major concern here and the mechanized sliders have an extra point of failure – what happens when the motor stops working? That said, nearly 30% of people said they are fine with bezels and notches, because these designs are simple, reliable and offer unobstructed access to the selfie camera. That’s the situation now, previous polls and the comments on this one make it clear that all of this is just a stopgap measure until cameras can go under the display. Then we’ll have the reliability of bar phones with the sleek aesthetics of a slider/pop-up phone.